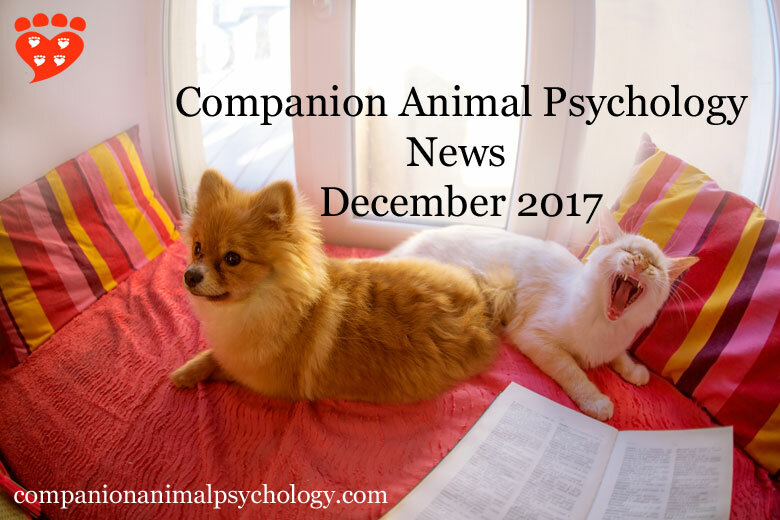 Unexpected friendships and the cat on the stove: make sure you haven't missed a thing with the latest newsletter from Companion Animal Psychology. "...the importance of knowing basic aspects of dog behavior for people who choose to share their lives with a canine companion, letting dogs be dogs, paying attention to the dogs' point of view..." How to give dogs the best lives possible in a human world. Marc Bekoff PhD follows up on one of my recent blog posts. “Until we know more, I think we should assume that cats have needs while we are gone, and even if they aren’t meeting us at the front door.” Does your cat miss you when you’re gone by Mikel Delgado PhD. "even though they do not provide their owners with the undying affection of puppies and kittens, most of our subjects said goldfish and hamsters perfectly embodied the concept of a pet." Hal Herzog PhD asks How "Pet-tie" are dogs? What about goldfish and lizards? “The main purpose in writing this blog is for us as professionals to embrace the fact that people love their dogs and are quite willing to find ways to help them. “ Suspending absences: not just doable, but being done. On separation anxiety by Malena DeMartini. Why I don’t recommend training reactive dogs with CAT by Tracy Krulik CTC. A nice explainer of what negative reinforcement is and why desensitization and counter-conditioning are better. “I admit to feeling a couple of weeks of post-canine depression but every time the sentiment threatened to overwhelm me, two tiny plaintive eyes would meet mine, accompanied by a vigorous swish of the tail and a barely audible squeak. “ Puppy love: how my dog taught me to be a real man by Grant Feller. "The first thing to do is to take a few moments to consider what these seasonal hazards could be." Tips for a safe and happy Christmas with your pup by Nick Honor CTC at K9 Puppy Stars. Want to know what Felis silvestris lybica looks like? This is the animal your cat evolved from by Ilana Strauss. "A dog's extended tongue should be on dog lovers' radar." When we're angry, dogs get the feels by Julie Hecht MSc. Your cat is even smarter than you think. Modern Cat magazine reprints two answers to common cat questions from the late Dr Sophia Yin. “We adult humans rarely feel this purity of emotion, and if we do we tend to squelch it.” Patricia McConnell PhD CAAB shares the tiny things about her dogs that make her happy. “Solitude should be that meddlesome…” The cat on the stove by Daksha Hathi at Katzenworld Blog. Unexpected friendships with animals and humans. Amazing photos by Diana Bagnoli, writing by Dee Swann. Cats Protection has made some wonderful videos with John Bradshaw. Here’s how cats hear and how cats see. Loving you, loving me: Companion Animals and domestic violence – a (visual) research project. Images from the project on domestic violence and animal abuse by Heather Fraser and Nik Taylor. Gorgeous photos of cats by Observer photographer Jane Bown. Limited edition prints available. Minimal cat art. The Modern Met explores a new subreddit. Margaret Mahood’s feline art over at The Great Cat. “Find out what a dog’s nose knows, and why no amount of bathing and dousing in perfume can mask your personal smelliness.” In Air Apparent, Big Picture Science speaks to Alexandra Horowitz (and before that, Sam Kean will blow your mind on the atmosphere!). In PetMD’s Life with Pets on Pit Bulls, Victoria Schade speaks to Bronwen Dickey, Lori Nanan, and Richard Hunter. Should we keep pets? Anne McElvoy talks to John Bradshaw, Philip Howell, Jessica Pierce and Laura Purcell (preceded by a very nice clarinet sonata). Litter Box Basics by Beth Adelman. Pet Professional Guild webinar Thursday 18th January 1 – 2pm Eastern time. The Emotional World of Dogs: New insights into training behaviour. Presented by Daniel Mills and hosted by The Academy for Dog Trainers. 7-8 July 2018 at Women’s Humane Society, Bensalem PA; and 28-29 July 2018 at East Bay SPCA, Oakland, CA. I was thrilled to learn that my post, The Ultimate Dog Training Tip, has won the 2017 Captain Haggerty Award for best book or article on dog training from the Dog Writer’s Association of America. The book of the month is The Emotional Lives of Animals: A Leading Scientist Explores Animal Joy, Sorrow, and Empathy ― and Why They Matter by Marc Bekoff. More on the Companion Animal Psychology book club. In my latest post at Psychology Today, I look at a new study that looks at how the medical literature on dog bites covers dog behaviour – and finds errors and exaggerations. Moral panic about dog bites in the medical literature. This month I’ve had two amazing posts that you will not want to miss: How to make the world better for cats, and how to make the world better for dogs. In each, an incredible line-up of experts answers the question, “What’s the one thing that would make the world better for dogs/cats?” Their answers are varied, thoughtful, and inspiring. Extra early socialization for puppies makes a big difference reports on new research from Guide Dogs (UK) that finds a new, additional socialization program makes a difference to the behaviour of those puppies once they’ve grown up to be dogs. And escaping dogs: some fences are better than others looks at a study that finds dogs escape from electronic fences at twice the rate of a physical fence. Do you enjoy these newsletters and find them useful? Are there any changes you would like to see? Let me know in the comments or via a message on social media. As always, subscribe to Companion Animal Psychology to stay up-to-date on evidence-based information about our relationship with pets.